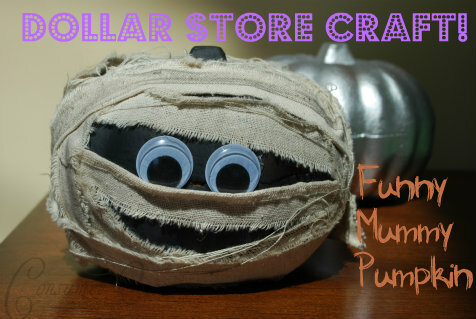 Dollar Store Craft: Make this adorable Funny Mummy Pumpkin for less than $2! I’m in a crafty moody? How about you?! One of my favorite places to get supplies is the dollar store. They have great seasonal items, and you can’t beat the price! My kids loved these little pumpkins. They are cute, but kind of plain. Don’t worry I can fix that! 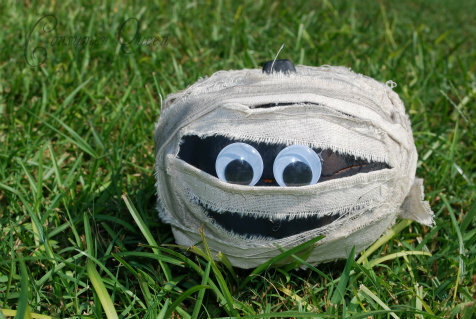 For this cute Mummy Pumpkin all you need is the pumpkin, googly eyes (or just make paper eyes), linen or gauze, and your glue gun! Painting the pumpkin before is optional but I loved the way it turned out! First thing I did was spray paint my pumpkin black. While that was drying I ripped strips of linen about 2 inches thick. The pumpkin is small so it doesn’t take that much to cover it. I used about 3-4 pieces. If you don’t have any fabric you could use medical gauze. To make it look aged, rub the edges with an ink pad. If you don’t have an ink pad you could use some makeup, like eye shadow or bronzer. My goal is to use what I already have in the house! 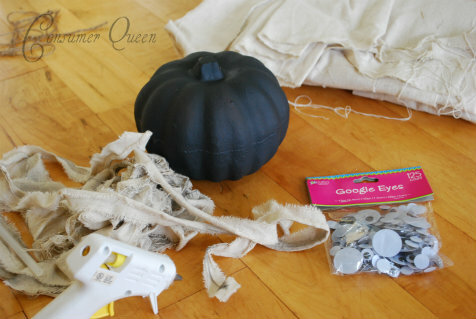 Then start wrapping the fabric around the pumpkin, gluing every few inches. I decided where I wanted the eyes and glued them on first so I knew where to place the fabric. I left a small mouth sized opening. It almost looks like it’s smiling! I think it turned out adorable, and it only cost a little over a buck! Mummy Pumpkin!